Cha Cha’s Latin Kitchen is my new favorite, allergy-friendly restaurant for date night. My husband and I have tried to make it a point to keep date nights going since we’ve been married (turns out work, groceries, errands, and other married life stuff can kind of get in the way of that). My favorite newlywed date nights have been at Cha Cha’s Latin Kitchen in Brea, California. My favorite tacos and my all-time favorite salad are created here. When it comes to food allergies, I often feel that I am forced to settle for food that is not so great in taste. Sure the food is safe for me, but do I really crave it again, let alone want to eat it again? With Cha Cha’s Latin Kitchen, I definitely do not have to compromise. I get a wonderful date, the great atmosphere, and both safe and amazing food. I have two favorite dishes at Cha Cha’s Latin Kitchen, both the chopped salad and the tacos. The Chopped Salad (ordered without cheese) is so delicious, and VERY allergy-friendly. As in top 8 friendly: no peanuts, tree nuts, milk, eggs, fish, shellfish, wheat, and soybeans. But the tacos are to die for. 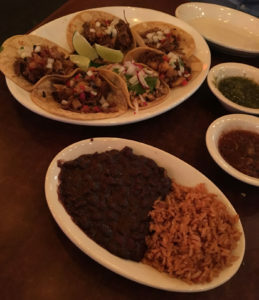 The tacos come with a side of beans (ordered without cheese) and rice that are also delicious, and safe for me, with no nuts or dairy. In the beginning I tried the different tacos (chicken, steak, carne asada, and carnitas), but now I order all the same. Carnitas tacos are the way to go. The meat is cooked so well that it melts in your mouth, but the star is the pineapple salsa. I literally dream of the pineapple salsa. My husband may tease me sometimes when I say this, but I can honestly say that while I’ve had authentic Mexican tacos in Mexico, I would argue that these tacos beat out the best of the best. Now go out and eat some delicious tacos at Cha Cha’s Latin Kitchen! I also suggest visiting on Tuesdays for their Taco Tuesday deal!